For my fourth BMG tournament I decided to take the Court in the configuration shown here, with a few changes from the previous post when at the time I did not anticipate getting all the options painted. High Council Member instead of Benjamin Orchard - for 2 reasons: firstly, the High Council has a ranged attack, so offers a little more threat (I really do not want Orchard getting into a fight); secondly, the High Council has Endurance 7 which represents a tipping point against attacks doing either 2 damage or 3 damage (Blood or Stun) - he becomes less susceptible to being one-shotted. James and Nathan O'Malley instead of the Butcher - the O'Malleys offer an extra model for contesting / controlling / threatening / attacking, vital in trying to minimise enemy VP and maximise my own; in addition, the 6 Attacks the O'Malleys offer are simply more efficient than the Butcher's Claws; finally, the O'Malley's do their respective tasks well (James as as back-line defender and as Bodyguard to the Leader, freeing up the Leader to get more involved; Nathaniel to de-buff enemies) while the Butcher does not really do anything very well in my experience, which is a real problem as he is the crew's most expensive character in game terms. It was an enjoyable day as always, seeing familiar faces such as Kieron of Cheaphammer, and going along with Brummie/Simon to his first tournament. I had two draws and a win with a crew I am still getting used to. I came sixth out of 12, which I was happy with all things considered. On the day I fought against two League of Shadows crews (one with Catwoman to rack up VP - the Court have nothing that comes close to that), and a Scarecrow crew lead by Deathstroke and including Zsasz. On the day, I don't think I made too many mistakes and I was always on the back foot in line-up given that I was giving up 21 Reputation, which is the equivalent of a Henchmen in most crews, but the right decision on balance I feel (a couple of new 45-50 Reputation Talons would be most welcome to give the Court real options). Once the Court engages the enemy they put the hurt on to a very respectable level, and I think are almost peerless in that regard; all of that is down to the plethora of Handy, Sharp and Blood damage. The thing for the future is maximising that advantage and learning to take some more risks with them to make them feel really competitive. 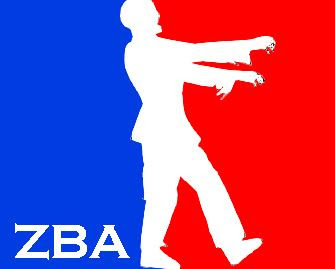 Both in the tournament and out of it I have fielded the Court against Penguin, Bane, League of Shadows (twice) and Scarecrow crews, and in all of those games Stealth had little or no impact, which is the biggest hurdle I feel with the Court - being able to close with the enemy without being gunned down. 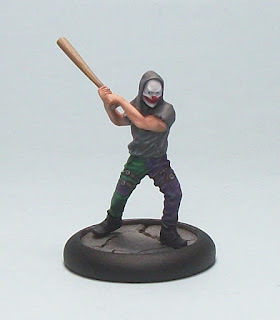 This is my just-finished Contra-Auguste, another Joker Henchman. I had planned on building up a Joker crew as mentioned a while back, but I got sidetracked when the last Court of Owls crew box was released as that was a far more appealing option for me. 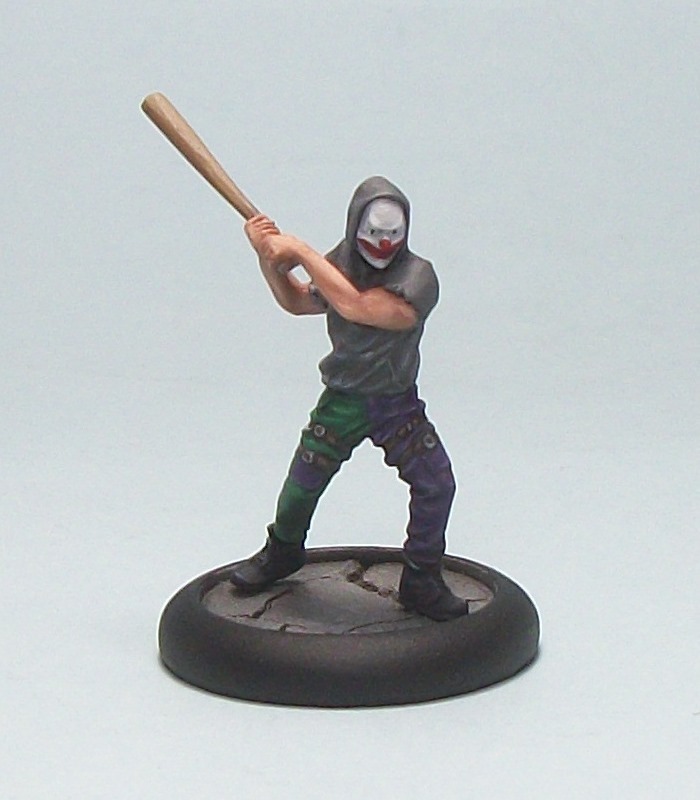 In fact, I think I have painted 10 other BMG minis between this Joker Henchman and the last (August). I completed Contra-Auguste primarily as I had a little spare time and some 'extra' painting motivation while working on an unrelated mini, and managed to get a good chunk done earlier in the week after previously starting and abandoning the mini (I started a few Joker Henchmen at that time to speed up some of the painting). That said, The next crew I want to finish off isn't Joker, and is one I hope to conclude within the next two months (a personal deadline). Then again, I think I have a Joker list in mind which only requires me to finish 3 more minis, so who knows? Painting Contra-Auguste puts me just 1 mini short of my BMG painting target for the year, with 9 months to go, which I think will be safely beaten. The mini suffers unfortunately some of the common issues of Knight Model's casts, and was not a crisps cast. In addition the super-soft metal used saw me bend the bat after painting was finishing with light accidental finger pressure. The metal compound seems to vary significantly between models I have from the range. 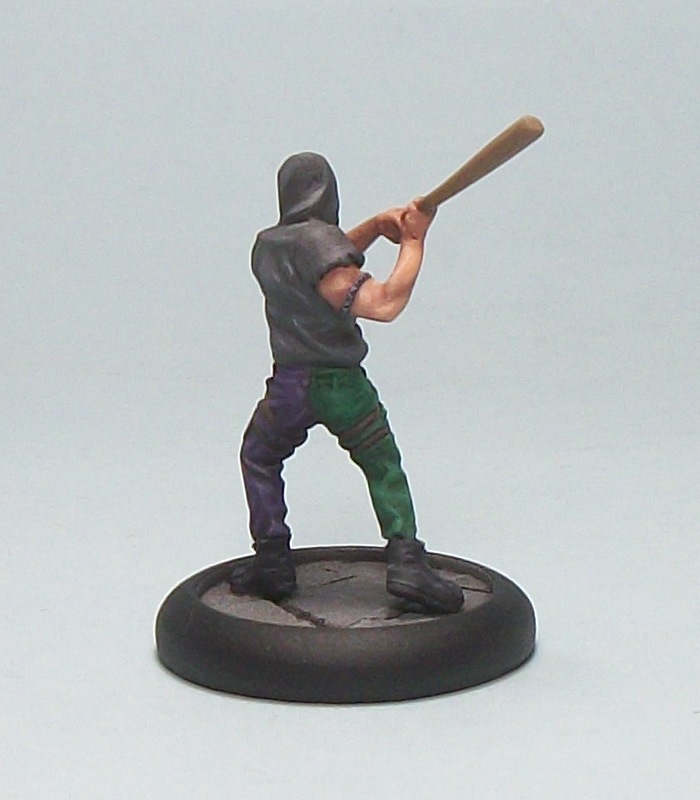 I game terms Contra-Auguste looks an interesting proposition; I am not a fan of the Bat/Baseball Bat weapon, as I think it is inefficient, but with the model's Obsessive Trait he actually damages on a 3+ against the first enemy he starts attacking until that enemy is KO, but has to carry on whacking it into the ground so is a win-lose proposition. His Defense 3, Endurance 5 and Hardened should make him surprisingly durable for such a relatively cheap (in Reputation) model, which is part of the reason why I had planned to include him in my Joker list. 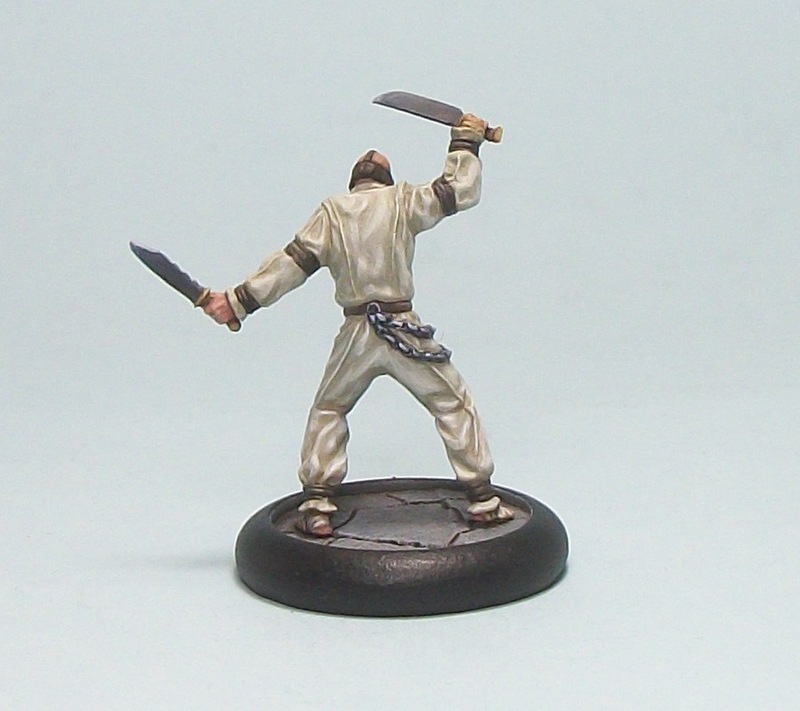 A couple of hours work and I have added a surprise completed mini to my BMG collection. I say surprise as I had a notion of doing High Security soon, but wasn't sure when I would get around to him. Well a couple of hours spare during annual leave today saw him done, and he will probably get an outing next week as part of a Poison Ivy crew. For a quick turnaround i am pretty satisfied with the results. 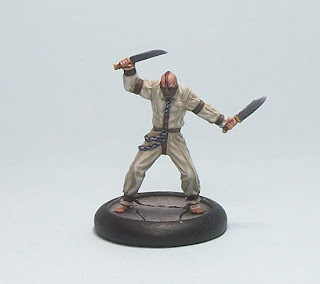 I had put off painting more of the Prisoners as I was becoming averse to painting orange (probably my least favourite colour to paint), but a week or two ago I had an insight into how I could tackle High Security - make him match my Arkham Asylum inmates such as Pavilion A Subject and File No. 08923. As soon as I decided that, he jumped up the mental painting queue, then circumstances arose to give the Poison Ivy crew a run out, and sudden painting motivation hit and he was finished pretty quickly. 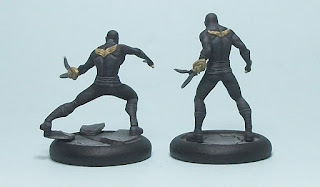 High Security is my tenth BMG mini of the year, out of an original target of 12 (I had planned one pre month...), following a few days after finishing Nathaniel and James O' Malley for the Court of Owls. I suspect I will exceed that particular annual painting goal, and the sudden momentum is helping my overall productivity which is nice. In game terms I read good things about High Security. Certainly, at 48 Reputation he is not a cheap Henchman, and I dismissed him early on because of that, but Combo with Knives, coupled with +1 Strength and CRT: 1 Blood from Devastating Blow makes him a real threat, especially if he can take out an enemy model early in the game. 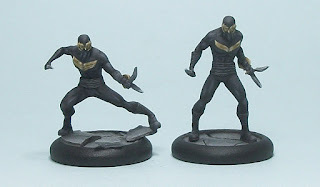 Finishing James and Nathaniel O'Malley means the last two Court of Owls minis done, meaning I have painted all of the minis made available for the crew so far. They were started at the same time as Brandon O'Malley and set aside when I wanted to focus on finishing that model. I kind of rushed them towards the end just make sure I keep 'getting stuff done', but the most important thing for me is that they are finished. Both appeared along with Brandon in the Talon series; Brandon is Nathaniel's father, and James is Brandon's sire. In the story, Nathaniel is revealed to have ensured he is the last O'Malley to serve the Court of Owls, and is shown as a disappointment to his father and especially his grandfather. All things considered about these two additions, I am giving serious thought about using them instead of the Butcher in the upcoming tournament simply as I don't think the Butcher offers very much for hist cost compared to the smaller Talons. It would mean taking a Reputation hit in regards to what is allowed, but is something I am thinking about.